Washington — Connecticut lawmakers at the U.S.-Mexico border this weekend said they were moved, and even shocked, by what they saw up close as the effect of the Trump administration’s immigration policy. “It was very emotional,” Courtney said. Many of the immigrants caught up in the drama at the border are Central Americans who are fleeing drug-related and gang violence in their countries. Some have traveled to Mexico, on foot much of the time, for a month or more to reach the United States. 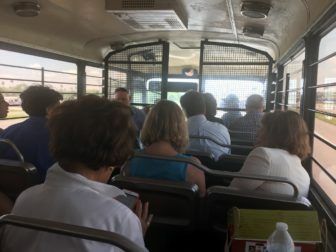 At the Brownsville detention center, the Connecticut lawmakers met with 10 Central American mothers who had been separated from their children. With Himes, who speaks fluent Spanish, acting as translator, the lawmakers determined that only one of the mothers had been able to contact a child. She had spoken to her daughter, who was taken to New York by the Department of Health and Human Services. It is the federal agency that takes charge of immigrant youth who arrive in the United States by themselves or who were separated by their parents since the Trump administration imposed its “zero tolerance” policy. Under the policy, parents were jailed and children were taken to DHS -contracted shelters. Courtney said the detention center where the mothers were held “is like a prison where they have to pay to use the phone.” But he said few had any money when they reached the border and others had their money confiscated. “The most disturbing thing without question was spending time with this group of moms,” Himes said. The Customs and Border Patrol personnel were “trying to do the best they can, as humanisticaly as they can, under an insane flip-flop at the White House,” Himes said. She said the detainees wore prison garb and were held in facilities where the walls were reinforced with double rows of razor wire. “When you think about it, these are misdemeanors we’re talking about,” DeLauro said. The lawmakers were not allowed to take photos, or bring cell phones or recording devices into the facilities they toured. They were ferried from place to place by a U.S. Immigration and Customs Enforcement detention bus. Reacting to scorching criticism about the separation of more than 2,300 children from their immigrant parents, President Donald Trump has signed an executive order to end the practice of separating families. But the order also called for the continued jailing of all undocumented immigrants, even many seeking asylum and first-time border crossers who would be charged with a misdemeanor. That executive order has added to the chaos at the border, the Democratic lawmakers said. “There is still a lot of confusion and a lot of panic,” Himes said. Since a 1997 consent decree forbids keeping children in ICE detention centers for more than 20 days, Customs and Border Protection agents have interpreted the executive order as allowing them to freeze criminal referrals for migrant parents who cross illegally with children, just as they did before the “zero tolerance” policy went into effect. “They pretty much told us the separations were over,” Courtney said. Reconnecting separated children with their parents is not going to be easy. All detained immigrants – even immigrants — are assigned “A’’ or alien numbers, only to be given different identification numbers by other federal agencies. 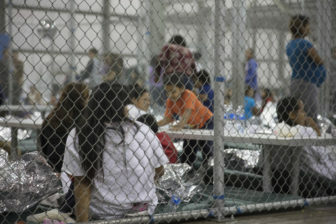 Many of the children have been taken to other states, among them New York, Florida and Michigan, and placed with family members or other court-appointed guardians. There are reports that parents have been deported without their children. Esty said “intense pressure” must continue to be brought to bear on the Trump administration to reunite immigrant children with their parents. Democrats believe they have reaped a political gain from the immigration crisis that was created by the Trump administration’s imposition of the “zero tolerance” policy, a move made to appeal to the GOP’s conservative base. In the midst of the controversy last week, House conservatives were unable to gain enough support to pass a hardline immigration bill. A more moderate Republican version is expected to be voted on next week, but approval of that measure is not guaranteed. A frustrated Trump undercut GOP efforts to pass the more moderate bill by tweeting that Republican leaders should give up on immigration until a “red wave” ushers in more congressional Republican lawmakers in November’s midterm elections. Sen. Richard Blumenthal, D-Conn., made a separate trip to the border this weekend with New Mexico’s Democratic senators Martin Heinrich and Tom Udall.